In July 2014, after reading a multitude of degrading portrayals of young people, including Jeremy Paxman’s “self-obsessed” generation, and seeing no counter-arguments, 17-year-old school girl, Eleanor Blackwood, decided to do something about it. She set up a social enterprise called The Artistic Horde, which aims to positively shift society’s perceptions by showcasing the artistic talents of this younger generation. The first event of which is The Remarque Prize. 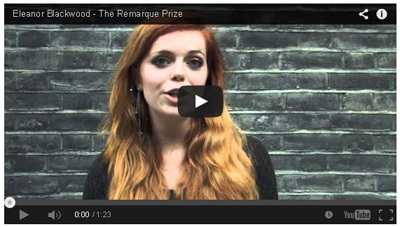 The Remarque Prize is a national arts competition for 16-25 year olds on the theme of Conflict. Entries may be in one of two mediums, poetry (written or performance) or photography. Named after Erich Maria Remarque, who helped cut through the prejudice of a generation with 'All Quiet on the Western Front', the competition's aim is to challenge ideas and perceptions, and so the theme may be interpreted in any way. The final of the competition is being held at The Frontline Club in London on October 28th. The judges include the esteemed author Sebastian Faulks for the performance poetry, and internationally respected photojournalist Paul Conroy of The Sunday Times for the photography. Contemporary poet and performer Anthony Anaxagorou and recent Roundhouse winner Higaq Osman are also judges. Others who are unable to attend but are kindly showing their support through their social media streams include Malorie Blackman Children’s Laureate, Ian Macmillan and the Forward Arts Foundation. "The Remarque Prize 2014 is a wonderful opportunity for those between 16-25 to showcase their artistic talents in the fields of written poetry, performance poetry and photography. As a prize set up by young people for young people, it provides proof positive that our young people are indeed innovative, imaginative and truly remarkable," say Malorie Blackman, Chilren's Laureate. "The views and values of an entire generation should not be dismissed based on numerical age or sterotype. This is as much a form of discrimination as anything else. I was frustrated by the negative media portrayal of young people and wanted to put forward a counter-argument - something that more accuratley portrays what young people can contribute," says Eleanor. The top ten poetry finalists will compete on the night and re-perform their poems to be ranked. The top ten photographers will also be awarded on the night, with their works showcased. In addition, there will be other prizes and commendations for others who have excelled, as well as feedback offered. There will be no cash prizes, as that is not in keeping of the spirit of the competition. Our primary concern is ensuring the recognition of young people’s talent, which we will do our best to champion. However we are in discussions with our sponsors who will be donating prizes. How will plagiarism be detected? What is the age range of the competition? We will be using a number of additional panels of judges to screen the first round and moderators will be used to cross check the assessment of the works submitted and ensure a consistent standard is used. We would be grateful if photos are kept to no more than 1MB to ensure easy email transfer, and videos are kept to less than 2 minutes in length. Performance poetry should be without props, costumes or music but all forms are accepted. From rap to iambic pentameter to plain text, there is no restriction on poetic form. The aim is to be as expressive as possible. We support all artists retaining the rights to their own work. In order to raise funds for War Child, we will be selling prints of the finalists work and some of the poetry entered in an e-book. Being published is part of the prize. However in order to do this, we will need your written permission for us to use your work for this purpose only, if we contact you. This will not affect your ownership of it. For all other purposes the copyright rests with the originator, and full credit will be given to the artist in all occasions. What if I can’t afford to come to the final in the event of selection? We are able to support those less financially able due to some sponsorship, however proof of need would be required due to sponsorship being limited. We are determined to ensure that means are not a restriction for competitive entry.